A lot of people ask, “What’s the NCCC been up to?”. Sometimes it’s more about relationships than actually getting dirty yourself. Lory State Park and the NCCC have had a great relationship for many years now. We worked together to create an accurate guidebook, establish proper access trails to the boulders, improve landings and develop a fixed anchor program to establish new roped climbs in the park. One of the primary reasons all of this happened is due to the dedication and help from Park Resource Technician Cameron Landis. Cameron and I have worked together a lot over the years coordinating trail days and planning out complicated initiatives. We’ve also climbed together on Arthur’s Rock a few times and became friends outside the bureaucratic logistics of climbing access and stewardship. 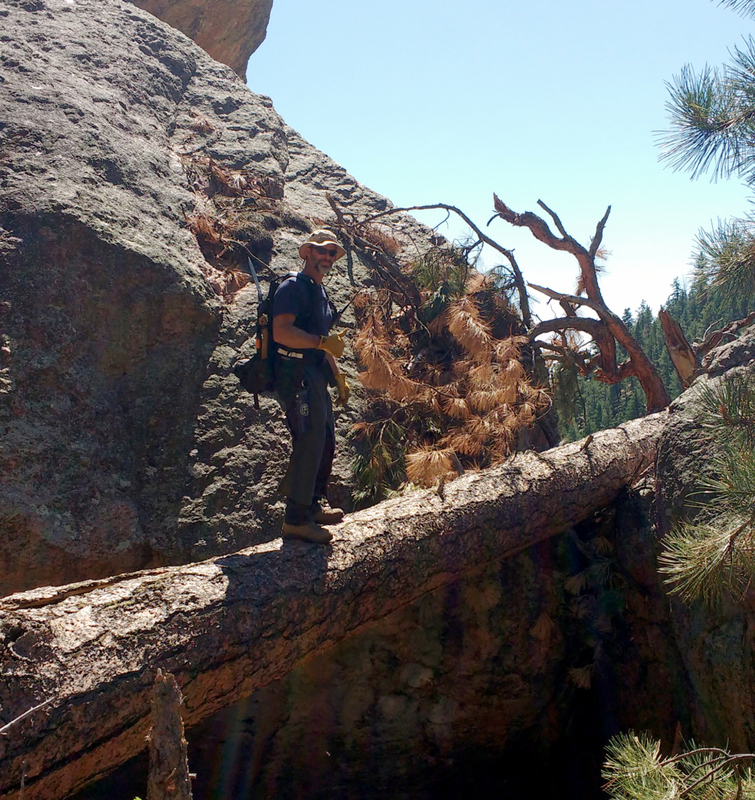 In August of this year word came through the grapevine that the majestic Ponderosa Pine above the Vice Boulder had fallen down due to wind. This enormous and majestic tree had loomed over one of the most popular bouldering zones in the park forever and sadly its time had come. So I sent Cameron a casual email explaining the situation and how I’d like to propose organizing a trail day to get it removed. About a day later I get a simple one line response: “We’ll take care of it later this week”. Later this week? I couldn’t believe he was going to act on it so fast, but that’s definitely how Cameron operates. I could tell Cameron was surprised something happened in the park that he wasn’t aware of and he was looking forward to the challenge it would present. uff, but what Cameron and the rest of the LSP trail crew pulled off is simply amazing! 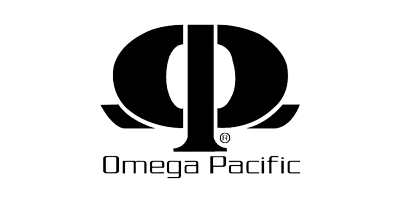 Can I get a list of ALL the equipment you used? – 2000lb come-along, “Tuff-Tug”. . . Inadequate! Set up a partial Z-pull (to increase leverage). . . Nope! – 2200 lb gas-powered winch, “Portable Winch PCW5000”. . . Inadequate! Wouldn’t even budge it until it was fully released from the root ball. – Sterling SuperStatic2 rope, 7/16″, ascender (? ), and quick-adjust daisy (during elevated saw work). – Sirius Bull rope, 1/2″, for winching. – An older Metolius entry-level harness (awful, lol). on slings, shackles, and climbing webbing, threaded links, lock gates. What was the total man hours to complete the project? We tried many different winching angles and setups, and when I cut a ~6′ section from the rock saddle that was propping it up, it slipped back about 6″ and dropped down ~12″ into a pinch-point cradle (!). . . that was the killer on this project as it was now fully compressed on both ends as well as top and bottom – there really wasn’t a tension component, it was all compression. . . . Due to the many attempts with complicated winching setups, hauling equipment in and out, and my rap-saw setups, it ate up a lot of man-hours: ~40. . . although we did other cleanup and clearing (from windfall) in the area as well. What was the sketchiest moment? 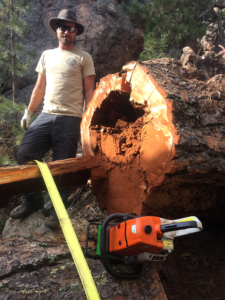 The first ~15′ or so from the root ball was total core-rot, the entire trunk was under compression, it was up to ~15′ off the ground with steep rock on the sides, so I had to rap in, and it (bole) had about a 4′ base with the narrowest cut at about 3′ dia. Also wasn’t sure if there was any true tension/spring in the root ball, as a good portion was still grounded/attached, and there was a large boulder hung up in the roots that we had to winch out. . . The entire situation, and just not knowing how it was going to react when I started to relieve the pressure with cuts, and when it did react, just where exactly I was going to bail/swing (ha). It was just an overall odd and sketchy removal. 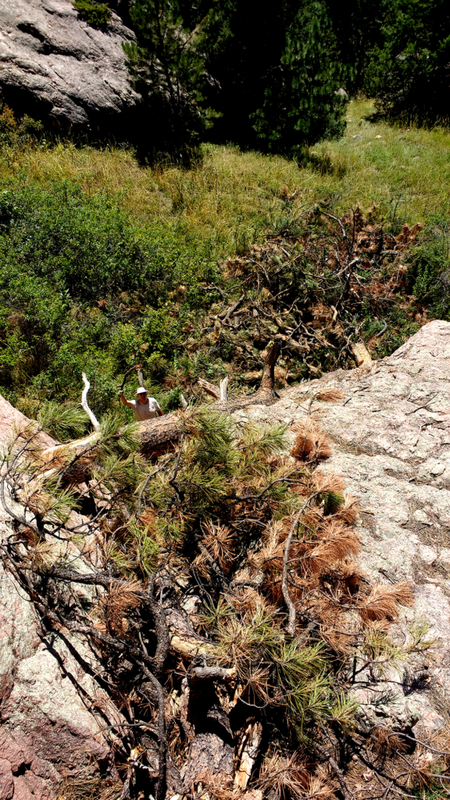 Whats your day to day operations at Lory State Park these days? Park resource manager and technician:” forestry, trails, invasive species, volunteers, equipment operator, trainer, “certified first responder”, “certified wildland firefighter”, climber, etc. . . . My seasonal trail crew (Colton Arnspiger and Jerry Benoit) and seasonal maintenance (Jordan Boge) helped with packing, rigging, winching and area clearing/cleanup above and below. Big Thanks and shout out to Lory State Park and Park Resource Technician Cameron Landis! 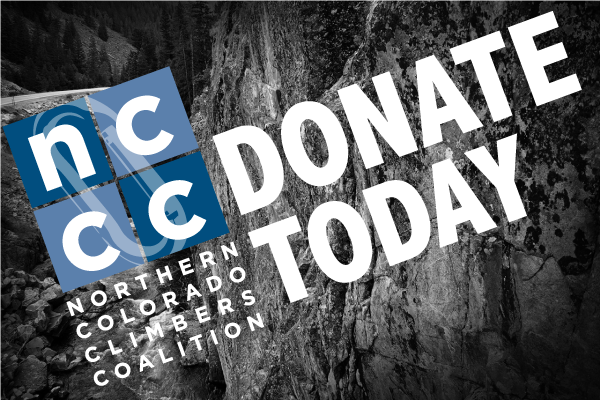 We owe you big time and now another great season of climbing at LSP can begin. Wow Ben, that’s quite the write-up! Almost made me feel worthy (:-) . 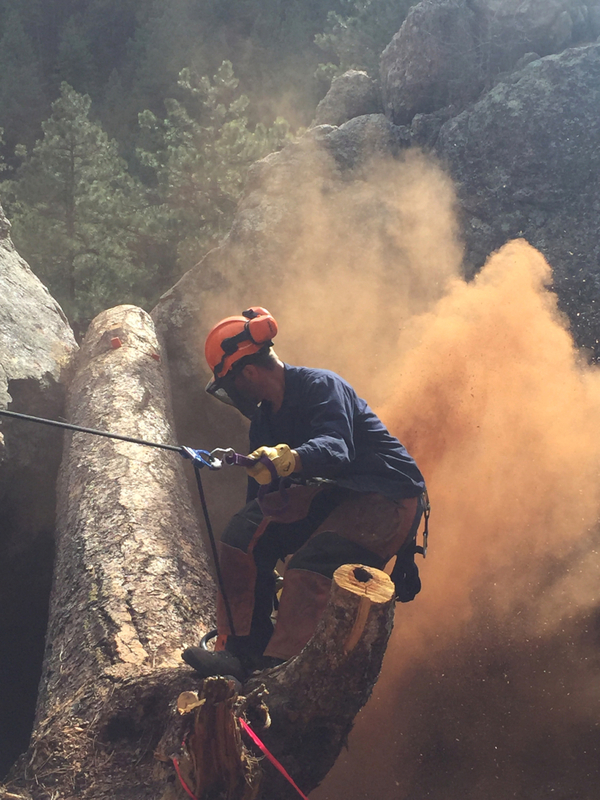 Thanks for keeping the community informed on this issue (area closures and cleanup), and other climbing-related information here at Lory. . . . It really has been a good partnership, benefiting visitors and managers alike. Sorry it took us so long to open Ode to Failure back up, but a few other priorities nudged it to the side. 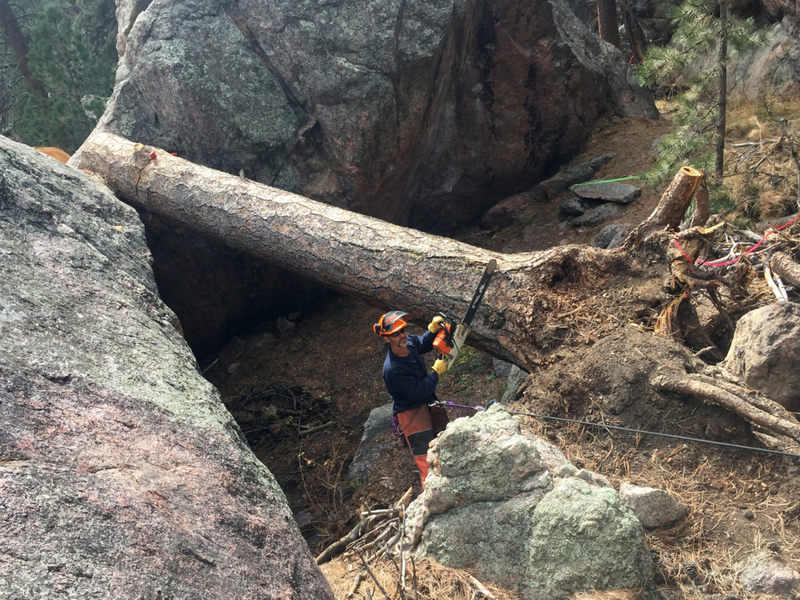 We still have plenty of blow-down to clean up and haul out of the general area, though the climber’s trail is all open and most of the debris has been removed from the routes. We’ll head up next week for some more cleanup/clearing, and will continue to poke at it until it’s completed. We should talk volunteer day sometime soon!